Boilers are a popular option for residential heating because they are durable and require minimal service. 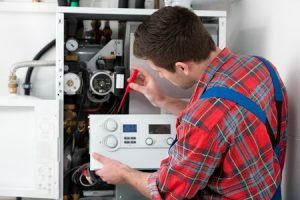 Keeping up with routine maintenance is the best way to keep problems at bay, but when trouble does arise and you find yourself in need of boiler repair or replacement, you need a service company you can depend on. At Rowell’s Services, we offer expert boiler repair and replacement throughout the Northfield, New Hampshire area, and our friendly technicians can help you and your family stay warm and toasty all winter long. As a homeowner, it is important to recognize when you need to have your heating system repaired. Boilers are relatively simple, and they are more reliable than many other heating systems. However, problems can stop pop up from time to time. Pay attention to how your boiler operates. If you notice any changes in performance, such as cold spots or inconsistent heating throughout your home, call for professional service as soon as possible. It’s also wise to call for help if you notice a sudden increase in your energy bill or you hear strange sounds coming from the system during operation. Eventually, your boiler will need to be replaced. These systems can provide several decades of reliable use when properly installed, but a replacement boiler may be a better option than continued service when repair bills start piling up. If you have an older boiler and you find yourself calling for service more and more frequently, it may be time to consider upgrading to a newer model. You may also want to consider replacement if the tank develops a leak or if the cost of heat your home increases. At Rowell’s Services, we offer expert boiler repair and replacement in Northfield, New Hampshire and the surrounding areas. We know how important it is to have heat during the cold winter months, and we are available 24 hours a day, 7 days a week for emergency service. Whether your boiler has completely failed or it just isn’t working quite like it should, contact us right away to schedule an appointment. Give us a call at 603-934-4145.